LEGO Boost is the latest product from LEGO that takes its famous bricks and infuses them with plenty of tech. The toy brick-maker is forging ahead with its focus on STEM based products as the trend in educational toys continues. LEGO Boost bricks are connected building blocks that help young people to learn coding. The interactivity of Boost does this by making your creations more fun and expanding the possibilities of what you can make. 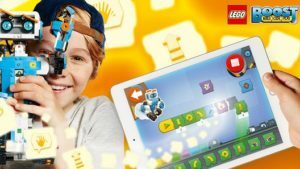 LEGO Boost will launch with five models users can build from its Creative Toolbox. Models are controlled through a companion app on Tablets. The kit features, Bluetooth-connected bricks, buttons, motors, and other connected parts. STEM education has been proven to improve the academic prospects of young people. As a result a huge push is being made to promote STEM subjects. Technology is now playing a bigger role in how the we live from day to day. Consequently, Science, Technology, Engineering, and Mathematics subjects are critical to the world’s future. This is the initiative that LEGO is looking to harness with Boost. In addition, the company also offers a LEGO Mindstorms kit similar to the upcoming Boost bricks. Mindstorms features a fully programmable robot that users can build and control. In essence, LEGO Boost will expand on that first foray into intelligent bricks. 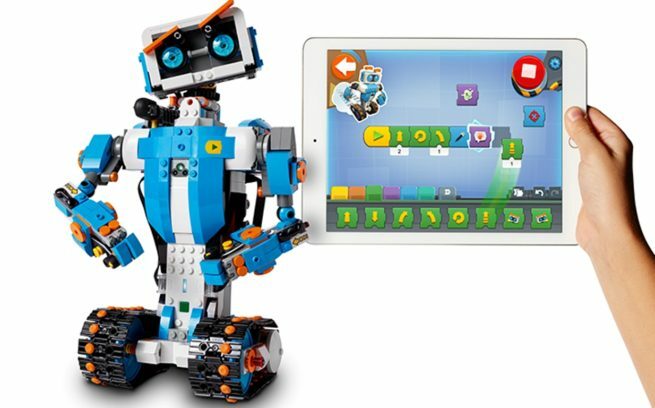 With a total of five programmable robots, learning to code will never be dull again! As the name suggests, LEGO Boot will give your regular LEGO creations a boost with their tech capabilities. Building your creations with the special bricks enhances the users understanding of coding principles. Furthermore, the connected bricks take your inventions to the next level by giving you the freedom of imagination. The LEGO Boost Creative Toolbox will enough connected bricks, sensors and other tech to bring five different models to life. In addition, there are sensor to help your Robot detect tilt, colour, and distance. Most of all Boost also includes smart motors that allow you to interact with your creations in new ways. Consequently, the modular nature of Boost means that the possibilities of what you can build are endless. As with ordinary bricks, you can therefore create whatever you want, only this time using smart, connected LEGO bricks. Another highlight of LEGO boost is that each model has its own character and unique attributes. The five robots are Vernie the Robot, Frankie the Cat, and another robot called M.T.R.4. Finally, there are two other models, one which is the Guitar 400, and the Autobuilder machine. As a way to get kids coding LEGO Boost is an ideal starting point. Because of its existing popularity and massive fan-base, LEGO is definitely one of the best ways to promote STEM Education. In conclusion, a great idea and a great product. LEGO Boost’s website also features lots of advice and resources to help you make the most of your intelligent brick kits. There is also a gallery where you can upload and share pictures of your creations with fellow Booster. Love using LEGO Boost? – Share your thoughts with other STEM Geeks in the comments section below!